This recipe is another from my recent purchase, America's Most Wanted Recipes by Ron Douglas. It's meant to be a recreation of the Chicken-Tequila Fettucine served at California Pizza Kitchen but a) I've never been to that chain and b) I didn't like some of the ingredients, so I adapted it quite heavily to make my own dish. It tasted really good! Place half a cup of chicken stock, 2tbsp tequila and 2 tbsp lime juice in a small pan. Bring to the boil then simmer until thickened and reduced. The recipe now called for one and a half cups of double cream. I had some in the fridge left over from another recipe but as you can see, I was debating whether to go with the healthier option and use 0% fat Greek yogurt instead... which I did. Serve with the pasta and broccoli - this was delicious! 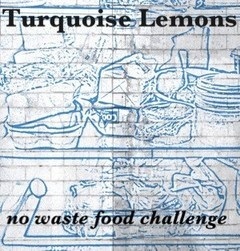 I'm sending this to the No Waste Food Challenge, hosted by Turquoise Lemons, as the theme this month is using up liqueurs and cordials. This is a great recipe if you have a bottle of tequila in the cupboard! how gorgeous!... I do love anything soaked in alcohol but tequila is a new one on me... I can imagine how glorious this must taste though and I do love the creaminess that yoghurt brings to a pasta dish... my favourite!